While reading an article about lung capacity my 7th grade students marveled at a picture of Dizzy Gillespie blowing on his trumpet. 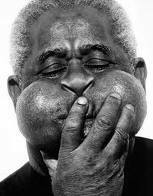 Me: That’s Dizzy Gillespie. He’s a famous jazz musician, but I don’t think he’s alive anymore. Student: (shouting) Is he dead? !